923 Error is one of common installation errors of Google Play and Android devices. You can get this error for WhatsApp too and it is easy to fix it generally. However if you cannot fix it with the guideline which we will provide you below, we recommend you to contact WhatsApp support as soon as possible since it will need a professional developer support. This error generally happens because of file conflicts or cache problem on your device and Play Store app. We are going to give you detailed information for you about that below. 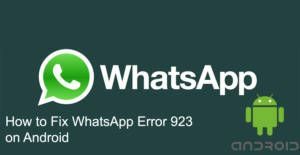 If you are having other errors while you are installing/updating WhatsApp, you can take a look at error code list of How to Chat Online. It is only for WhatsApp installation errors. This problem can be fixed with 3 different ways and we will provide summarized information of these solutions for you below. If you are not familiar with your phone’s or tablet’s settings, we recommend you to take a look at this step by step guideline first. If you don’t need step by step info and if you are good with settings of your phone, you can look information below to fix Error 923 on Android. 1-) Please clear cache and data of Play Store application first and then restart your Android device. 2-) Clear cached data of your phone (This can happen on storage settings of your device.). Remove all files you don’t need. Delete pictures, videos and audios which you don’t need. You can also move needed files to another storage source. (Such as HDD, Memory Card, etc). Uninstall applications that you don’t use. 3-) Go to security settings of your phone and enable Unknown Source option there. Go to official website of WhatsApp and download the application from there. You can click here to go to download page. All done. Please give a try to WhatsApp after each steps you have done. If you cannot manage to do first two steps, do the third step at last.